Connect your Facebook Ads account to HubSpot to create and manage your Facebook ads in HubSpot's ads tool. The HubSpot user who connects a Facebook Ads account must have Publish access to the ads tool in HubSpot. The HubSpot user who connects a Facebook Ads account must be an admin of the ads account in Business Manager. This user must also be an admin of any Facebook page(s) that ads are posted to from Business Manager. The Facebook Ads account(s) and any Facebook page(s) must exist in the same Business Manager or there must be a partner relationship between the Business Managers that each asset exists in. If users need to share assets between Business Managers in order to create the partner relationship, users must have admin access for pages and advertiser or above access for ads accounts in both Business Managers. For users to create a Facebook lead ad in HubSpot, they must also be a Facebook user who has admin access to the Facebook page and the advertiser permission level or above for the Facebook Ads account connected to HubSpot. The user connecting the Business Manager with HubSpot must have Leads Access in Facebook. By default, all page admins and connected CRMs have Leads Access, unless Leads Access settings have been customized in their Facebook Business Settings. HubSpot needs to be granted access to Facebook business pages that you want to enable for lead syncing. During the connection process, if you click Choose what you allow in the pop-up window and remove page permissions that HubSpot requests, leads from those business pages cannot be synced to HubSpot. To re-establish these permissions, disconnect and reconnect your Facebook Ads account from HubSpot, and leave all requested page permissions enabled. In the dialog box, select Facebook. In the pop-up window, log in to your Facebook Ads account and click OK. In the dialog box, select the Facebook Ads account(s) to connect to HubSpot, then click Connect. If you have a Marketing Hub Professional or Enterprise account and multiple Facebook Ads accounts, a list of your accounts will appear. If you want to track contacts that interact with your ads, leave the auto tracking switch toggled on. This will apply HubSpot tracking to your Facebook ads. In the dialog box, select the Facebook pages to sync leads from, then click Save. 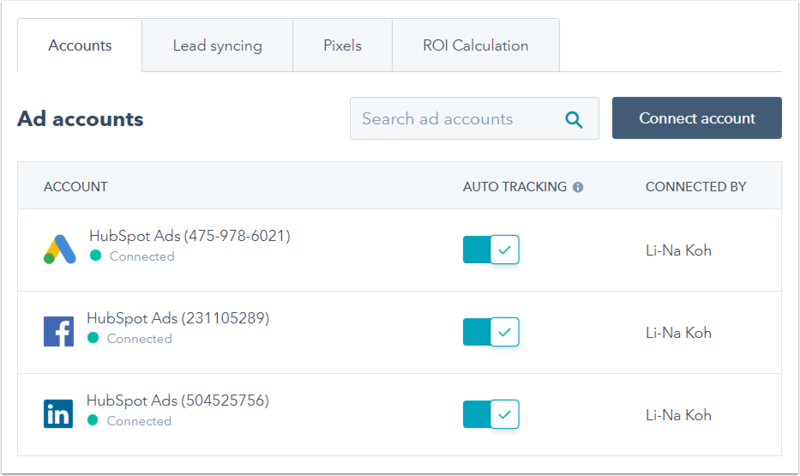 The connected Facebook Ads account(s) will appear in your Ads Accounts settings in HubSpot. Learn more about managing Facebook pages syncing leads to HubSpot. Any Facebook pages syncing leads will appear in the Ads Lead Syncing settings in HubSpot. 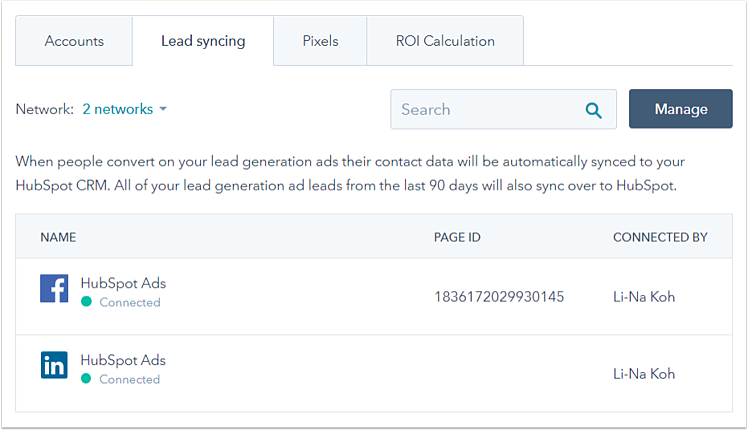 After connecting your Facebook Ads account to HubSpot, your existing lead ads in Facebook will automatically sync to HubSpot and appear on your ads dashboard. Learn more about existing lead ads syncing to HubSpot. Facebook stores leads from lead ads for 90 days after creation. When you connect your Facebook Ads account to HubSpot, these leads will be synced to HubSpot, along with leads generated going forward. Learn how to manage which Facebook pages sync leads to HubSpot. If you want to disconnect your Facebook Ads account from HubSpot, it's recommended to do so from HubSpot and not from Facebook. Disconnecting your Facebook Ads account in Facebook will remove all account connections that the logged-in Facebook user has access to, including all other Facebook Ads accounts that were not connected to HubSpot.